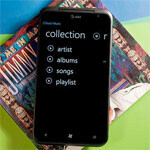 Have a Windows Phone, love music, and want to contribute to a SkyDrive music solution? Celltrac software is looking for you. Celltrac Software is working on an app called CloudMusic. CloudMusic enables you to stream audio files that are stored on your SkyDrive and they need a few good men (and women) to help them beta test. WPCentral got a sneak peek at the software and said while you had to organize your music in a specific fashion in order for it to work, the app has a simple layout with common page such as music collection, now playing, recently played, and new. They also noted that songs did take a bit to load, but overall it seemed that the app is heading in the right direction. If you’re interested in beta testing CloudMusic, shoot an email with your Windows Live ID over to support (at) celltracsoftware.com. My windows phone will be in the garbage after christmas, microsoft... never again! How is it that you dont like your wp7? I have had ios and android and webOS and so far after one year I won't leave wp7. Very cool, but I'm going to wait a while. Since Microsoft just gave access to developers to use the Sky Drive cloud functionality, I would guess that there are going to be a few people doing similar apps, so I'll wait and see what people come up with. I have sent an email and received a response thanking me for my willingness to participate and advising that I await an email with a link for instruction on installation within the next few days. I uploaded a few selections from my library from different formats in separate folders, and folders within folders to push as much bugginess as possible.